This is not a HAQ watch, however I have used it as a baseline comparison for my HAQ collection, so besides stopwatch timing, this watch has also begun temperature tests against a high accuracy time reference. Both tests are described in my methodology page. Against the stopwatch, the Seiko Solar has performed well over the course of the year, being just 3 seconds off UST on the ninth of September, 2015. I cannot recall when this watch was set, but indeed I cannot remember setting it at all in the year 2015. A baseline reading against UST was established for timing purposes, without re-setting the watch. Despite the watch being very close to UST at the time of the September 2015 reading, it should be noted that earlier test results show (as you would expect from a non-TC watch) that this watch has experienced inconsistent rates as the progression of the seasons has affected the ambient temperature. The watch has appeared to lose time in the warm summer months and gain it in the cooler months. 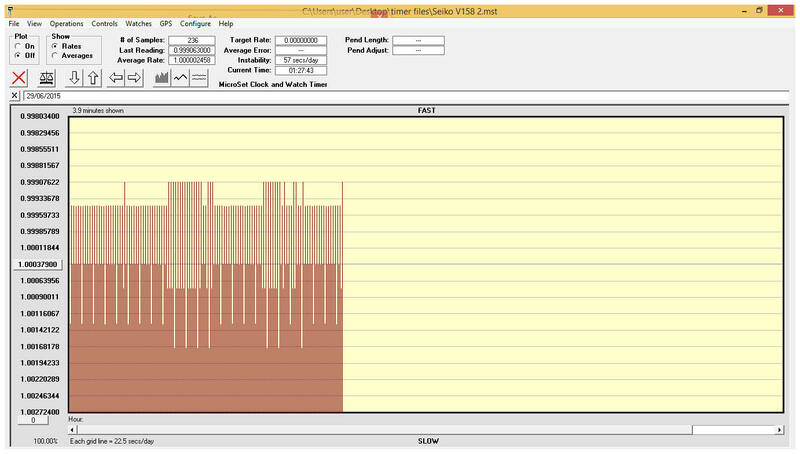 The MicroSet timing data, below, show that this watch has a regular 10-second inhibition period and a strange inconsistency in its general tick pattern. I have no idea what this means.